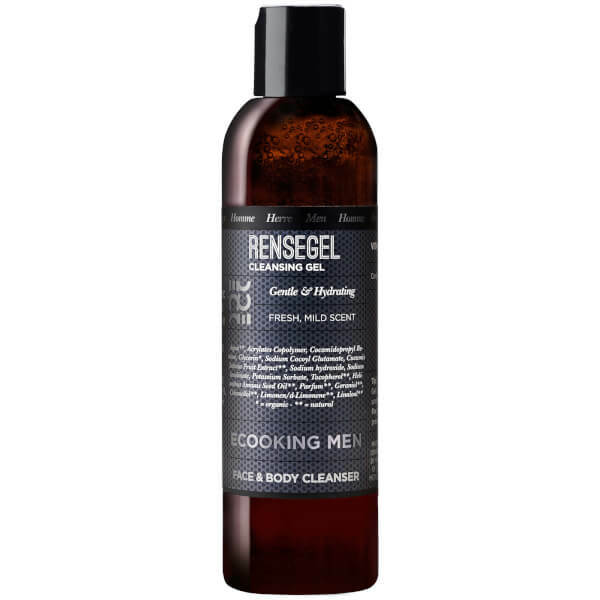 Freshen up with Ecooking Men Cleansing Gel, a gentle face and body wash formulated with natural and organic ingredients. Gentle and hydrating, the shower gel performs a deep cleanse to eliminate impurities and has anti-bacterial properties to prevent body odour. Nourishing, moisturising and cleansing all-in-one, the formula contains a cocktail of organic Cucumber extract, organic Sunflower Oil and organic Vitamin E to leave skin feeling fresh and protected. Infused with a fresh and mild Lemon scent. Foam up the Cleansing Gel and apply gently onto your face and neck – morning and night. The Cleansing Gel nourishes, moisturises and cleanses your skin in depth. Suitable for normal and greasy skin. Remove with lukewarm water. Aloe barbadensis Leaf Extract*, Aloe Vera Leaf Water*, Aqua**, Sodium Cocoyl Glutamate, Cocamidopropyl Betaine, Cucumis Sativus Fruit*, Glycerin*, Acrylates Copolymer, Phenoxyethanol, Cucumis Sativus Fruit Extract**, Citric Acid, Parfum, Octane-1,2-diole, Sodium Benzoate, Tocopherol**, Helianthus Annuus Seed Oil**, Potassium Sorbate, Sodium Hydroxide.